I’m still crunching on my non-webspam logistical project, plus I’m about 400 emails behind. I’m also going to fly up to Kirkland on Tuesday and Wednesday to say hello to the Webmaster Central team and check in with them. I feel bad for not posting much recently, so I rummaged around and found this gadget post. If you want an SEO fix, check out this interview with Eric Enge that I did last week Sept. 24th (time flies!). If you still want more SEO, you may not have seen this interview with Dan Keen that I did several weeks ago. Okay, back to the gadget post. 🙂 Conference schwag is mostly lame. Here’s an idea for some killer schwag that people would actually use. “Wow, what a wonderful idea!” I told the other fellow at the session. “Yup, they’re great at conferences and airports where everyone wants extra power outlets,” he said. (I didn’t get the guy’s name.) You can pick up these AC adapters at any hardware store for a few bucks. You can see where this is going, right? Rebrand these adapters as “Airport/Conference adapters” or some other cool/hip name. By the way, if you don’t think AC adapters can be branded, I’ll politely remind you about the PowerSquid. Wow, you guys have ugly looking power points in America. They now even make those gadgets with surge protectors. BUT ON THE SUBJECT OF HIDDEN TEXT & PENALTIES as discussed in that interview, SearchEnginesWeb does indeed have a few critiques. These critiques are passionate and frank – there is no need to take them personally or be hurt by the outrage. —> Never decide what the public should and should not see; let the public decide for themselves. With the exception of malware and useless spam, you have an ethical obligation to allow the free flow of information. —> Webmasters should not be treated like they are being jailed or suspended. If you detect hidden text – go the extra distance to analyze if the hidden text is UNRELATED to the displayed text. Then, manually remove it from showing up for those SERPs keywords only – but leave it in the index for their valid keywords. If the Website has *RELATED * hidden text – leave it alone. The hidden text may be synonyms or acronyms or hidden so as to not conflict with the design aesthetics of a homepage. Many Webmasters would love to make flash pages or graphic homepages because of beauty – then HIDE the homepage text – but have the text on other clickable parts of the site. We do not live in a perfect world. It is idiotic to pretend it is and to be adamant about absolute ideologies. This just is not realistic nor is it fair and practical. It is also dangerous. When you get to the point of deciding what tactics should ELIMINATE a site’s appearance in Google’s SERPs, you cross a line that could have a harmful effect on Web design and information flow and access. This reply is designed to make Googlers think, it should not be seen as an attack on sensitive egos. Every policies enacted affects hundreds of millions or strangers around the world. Think and discuss this reply with perspective and objectivity. Other folk on this blog go to Conferences a lot more often than I do but has anyone ever got one of those swisstravel adapters as a freebie? http://www.swisstravelproducts.com/power/power.html – It takes any plug and outputs it into any socket. I know friends that have bought 3 or 4 of them but if you combine it with Matt’s idea then you be set up for international business travel! Would save you a few quid too as they cost about €20 each. I think I’d wait for the Apple-designed adapter – it’s got to be possible to make one that isn’t that ugly. I foresee a problem with this kind of handout though. Imagine a cluster of conference-goers around a socket, with adaptors plugged into adaptors to run umpteen laptops off a single plug. I’m no electrician, but that doesn’t sound like a good scenario to me – it’s something conference venue owners probably won’t want to encourage. I read complete interview, it was very interesting. I have one query. I have seen sitewide links are more effective than link from one page of any website. But don’t you think that sitewide links are more look like paid links? I know it is bit off topic, but i am really eager to hear few words from you on this. Only last month, someone blogged about the lack of availble power sockets at conferences and how he always took a multi-way adaptor to guarantee getting power, and was then able to offer a few empty sockets for a few other people to hook up too. If you’re going through any sort of voltage converter box 100 — 220 Volts then be sure not to add too many points and overload the system. At SES London last year, one of the convertors smelt a bit frazzled when running about 8 laptops, and eventually cut out. @Matt, I like the furious paint proficiency of which you are in posession. 🙂 Can I haz googol p0wer tew? -I do have a question: as you mentioned both your non-webspam project and Webmaster Central in close proximiy; will we see some significant (non-design-related) changes in the logistical functionality or usability of WC? Searchenginesweb – if people wnat a flash or graphic homepage why not use the tag, that is exactly what it is there for. Can’t see the logic of the rant. Without rules/guidelines the web will be even more like the wild west than it is already. LOL I got a bunch of these things.. Didn’t realize people didn’t know about them? The best schwag is usable schwag… retractable modem cord isn’t a bad one (just too much of it). Wish someone bothered with retractable ethernet… would be handy. This really isn’t a bad idea. I know I’d keep one around. Very handy. I hope as a Googler concerned with the quality of your index you’d have a look at either the email I sent you or one of the many posts in the webmaster centre of google groups. I still carry one of these in my laptop bag. It came in handy many times in college – where for some reason lecture halls only had about 4 plugs per 100 students. Actually on this topic, what is the maximum number of plugs you’ve seen run out of one socket? I was at a small conference once in the Jameson Distillery where they ran 31 plugs out of one socket, which included laptop, pcs, tvs, and a band’s amps and PA system. Amazingly we didn’t all die! i only read this blog nowadays for the pue joy of seeing what Sarchengineweb has to say. Would you not let him contribute to your main pages ? This has to be SEW. No one in their right mind would ever care what that guy has to say most of the time. The one time he gets a point right never makes up for the 999 he gets wrong. Anyway, on to the adapters. If you’re going to give them away, you’ve got to get the ones that have the 180-degree swivel (most of them don’t, but Home Depot carries them). That way, you can point them straight down to the floor and tape off the wire if you want to. Think of the duct tape possibilities! Big silver lines across a low-pile red carpeted floor. It’s what the chicks dig. I always carry one and i recommend the same to my friends and collegues, Very useful, Also I was looking for All in one Charger with this additional Extension Cords. We all know what a pain it is to carry chargers for Iphone, Camera, Laptop, Phones etc. I have a 4 way adaptor that is in my away team kit that goes with my laptop i have a duplicate phone charger (and i might get one of those hand cranked multi phone type ones) I cary spare patch cables usb hubs, mic’s, balanced cables ect. I think Vanessa did a post about how she preped for conferences. I’me involved with on a formal conference on the organising side and next year i will be taking a small toolkit plus my networking tool kit (and probaly a few wrt54g’s and switches) and lots of gaffer as we want to try having a small private network for the top table. I think you may see something like that at Pubcon this year. I blogged about something similar during last year’s Pubcon (http://www.morgretdesigns.com/index.php/2006/11/14/a-branded-product-id-love-to-see-at-pubcon/) and Brett said then that he had added it to the list for next year. I didn’t think of having them as individual schwag though, just as having plenty of outlet strips available in each room. I had one of these at SES San Jose. Worked our nicely! I have several of those small cube plugs as I like the size. No matter how big the outlet though, I can never seem to find the right plug to pull out of it without wrapping a little tape around the cord with a note telling me “monitor”. And don’t you go into blog withdrawal…? Matt… do you have cache control on? I tried commenting, but nothing showed, so I tried again, and it gave me a message saying that it looked like I had already submitted that. So, what you are saying is: ALL sites can do as they wish with their own sites, but this EXCLUDES Google. Isn’t THAT “unethical and undemocratic”? Worst blog entry to date! Stick to the ‘make my mp3’s legal’ idea, that idea was actually earth shattering and upset me i didn’t consider it first. We miss you Matt. Hurry up and get your work done. Nice job on the swag idea. I might have to do that at a show. Hmm. These are great. I heard about a privately sponsored think tank that is working on a way to boost the performance up to 25%. They are about to publish their work on adding a fourth outlet to the current industry ceiling of three. Matt’s been busy writing great articles about the correct use of nofollow for the Google Webmaster’s Help Group. 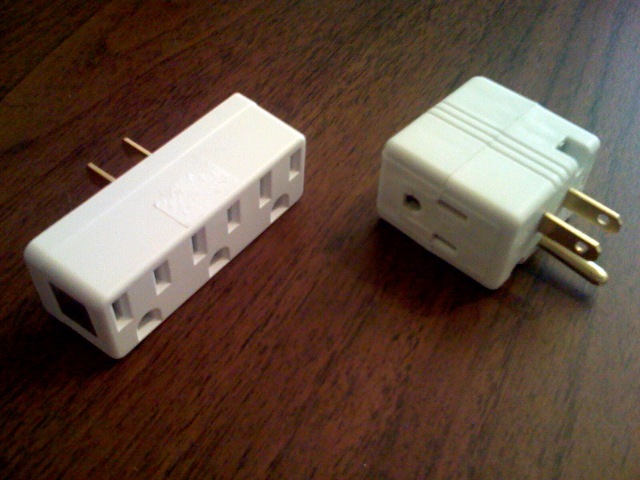 You might want to consider bringing along some outlet converters when travel internationally. Unfortunately while you have been off working on non spam related stuff, the India optimized SEO sites are really taking over. These are sites from the never ending emails we all get offering to do the 3 way link thing and they always come from people with made up names so they sound more americanized. These sites are really coming on strong. Me thinks the spam team needs Inigo Montoya back. I’m not one to monitor SERPs (waste of time anyway), but spamhound’s got a really good point as far as the number of spammy link exchange requests coming from India as of late. Hey spamhound, have you gotten any from eBrandz? Just curious. Matt, great post on nofollow on the newsgroup. As silly as it sounds, I never considered to use nofollow on internal site links. Excellent way to distribute PageRank without diluting down the flow to pages. Original Dave – Yep – it was a great post.. along with Eric Enge’s interview it answered alot of questions I had. I do have a couple questions though – they are related even if they seem not to be (if you’re wordpress SEO savvy you’ll understand where I’m heading). 1. I understand from your posts that robots.txting out pages and meta noindexing them does not stop pages from receiving pagerank from the rest of the site (I think) whereas rel nofollow does. What about a sitemap? If your sitemap points to pages that are otherwise internally rel nofollowed does the sitemap count as an followed internal link? 2. How many links on a HTML sitemap can googlebot handle without a) raising red flags or b) running out of steam – 100, 200, 1000? I have seen that but it’s always been given ‘approximate’ status.. ie ‘you should be right if you don’t have more than 100 links per page’. My main reason for asking is that for blogs using wordpress we have loads of duplicates all over the place (search “site:www.utheguru.com seo_wordpress” for an explanation). We used to think that meta noindex,following the dupes was the way to go but it seems that doesn’t stop PR being passed to them. From a plugin developers perspective the next best thing would be to rel nofollow the categories,rss,login,etc alltogether and herd googlebot toward a page that contains links to every single post in the wordpress blog – but I’m concerned that might have negative effects if the blog had large quantities of posts. There are alternatives but they’d be vastly more difficult to implement within the constraints of wordpress. This of course gets me dirty looks, even though im only trying to maximize profit from my outlet space. SEarCHenGinesWEB, do you not see the paragraph before you make a post? You never, ever have anything positive to say, and almost always go off topic. Matt, please consider using the ignore feature, or temp ban. Bear in mind that the “100 links per page” is more like a best practice guideline than something that’s a hard requirement for Google. That said, I think keeping the number of links on a page to something reasonable is a good idea in any case. My experience is that on all conferences they always give either CDs, or RJ45 retractable. Never got any AC plug 🙁 and got like 7 of RJ45 stuff. Matt, I wish you wouldn’t one-off Michael Gray. I appreciate that you take the time to respond when he calls you out, but many people realize that you’re just dodging the real questions at hand. Thanks for the feedback and link on the blog post I had which you politely mentioned in your interview with Eric regarding the hidden text on the aforementioned access panels . net website. While we weren’t as angry as Richie, we definitely were trying to find out how a particular site may be ranking higher than us in one of our niche verticals for a particular query. We did report it and confidently knew your team would be able to take care of the problem. I was also able to submit a post to hopefully bring up the topic to the ‘influentials’ in the industry of all things e-commerce. Our vertical is not unique or alone in the prevalance of ill-advised SEO practices to rise in SERPs, and we learned a good amount from previous posts on your blog from other webmasters who were being reprimanded for their actions (who were in our vertical in one case). Richie, is the site ranking well for any relative terms? If it is, how do you know the keyword stuffing is part or, or the reason for it ranking? I believe Matt has stated many times (and common knowledge in the SEO community) that Google mainly use spam reports to better their algo and/or test new additions to it. I would bet that Google can and do indentify keyword stuffing and ignore/discount it. I just did a quick check in the SERPS for: Property for Sale in Spain and alike and could find the said site? While you are chatting with the Webmaster Central team, any chance you can get them to change the page they have on that site about SEO making all SEO firms sound like scam artists? I swear if I were reading that page as a potential SEO client, I wouldn’t have any interest in SEO services either. Sure, a lot of the content is good info for people that know nothing about SEO, but there are some comments that are a bit too generally inclusive. For example, because an SEO doesn’t report every spam abuse it finds to Google, they aren’t ethical – “Ethical SEO firms report deceptive sites that violate Google’s spam guidelines.” Of course, if anyone has the time to report every single piece of spam to Google, they wouldn’t have time to do real work. Then there is my favorite, “For your own safety, you should insist on a full and unconditional money-back guarantee.” This is written just below the part that nobody can guarantee top rankings, which is fine and legit. But it does lead to the question of what kind of money back guarantee should the client look for if there are no guarantees? Personally, I am very good at the services I do for clients and have been fortunate to never have a client ask for a refund, so I don’t know how I would respond if asked. I don’t think that a company not willing to offer one is somehow unethical. Everyone’s time is worth money, and if someone is trying to get ranked on the first page for an extremely competitive keyword, I’ll work hard to do it and put as much time into it as the client would like to pay for, but knowing that they are paying for my time and not for guaranteed results. They are paying for my experience and expertise, which is not something I see as “refundable”, just like I couldn’t ask an attorney for a refund because he or she lost my case. Given, several of the comments define black hat and advising people to stay away from that is fine and dandy, but most of the things that are defined would be so beyond comprehension for most clients that I’m not sure who the target audience is. Anyway, sorry to ramble. I came across that page again today and it always irks me to see how Google views SEO firms. Sorry about my out burst but I am so fed up with all the sites that are cheating whilst we are trying to practice good and organic SEO. Times are hard enough already in Real Estate as they must be in the States and all over the world at the moment, this site is potentially taking value clients that could be going to agents that follow the rules! This site comes up for hundreds of search terms in google but the fact that NOTHING has been done over such a long period of time really alarms me. Dave (original) – yes, keywords in the stuffed text is coming up in the SERP’s – anyway, what is the point of having all these keywords on the frontpage? It isn’t exactly helpful to visitors is it? It is only there in my view to gain an unfair advantage. This site has next to no links, has an SEO score of 0%, uses frames and quite simply is a complete mess. Sorry if my post caused this thread to steer even more off course!! I guess it must have stirred up some strong feelings Richie has. Anyway, once you get your project out of the way, how about some more Q&A videos, they were real fun last year. Also, I have a new computer now, old one was rubbish, so I sould be able to watch without it crashing! IF that is true, whoever it was was WAY out of order. However, you tell soooooo many lies Keniki and talk so much crap I doubt it is. You ARE your own worse enemy Keniki and the biggest blog spammer I have ever seen, and I’ve see many. Central Ohio Search Marketing, the “SEO” industry has given itself a black-eye, NOT Google or any other business. It is up to each SEO professional to give themselves a good name, not Google. From what I read, Google have written these to protect those *who hire a SEO* and NOT to protect the SEO professionals. IMO they are NOT blunt enough. Any url handy of that article? Where can I buy one of those Google A/C adapters? Is that power adaptor fused? That would be a good feature to prevent overload and possible fires. Dave (original) – I agree that there are plenty of bad apples in the group that undeservedly call themselves SEO’s. I just always chuckle when I see that article thinking geez, Google hates our industry, despite also fueling it. I agree that helping those that need help is good for everyone, but unfortunately the people that the article is directed at aren’t searching for and finding that article. And the comment about not trusting anyone that won offer a money back guarantee is unfair to those of us that actually do things the right way. Wow – What’s all the grief about here? Why is it that 90% of those is the SEO industry always state their opinion as *fact*? Please delete posts above Matt and know there are know hard feelings from Keniki and I am gratefull. This is getting silly now and I just want out. Oh cut the crap already! It’s a foot race between you and Wall to see who can come up with the most pointless rhetoric (although he’s still winning just because people actually listen to his BS). If you “want out”, then stop posting, stop bragging, stop claiming that you’re outing blackhats despite posting no evidence, and stop drawing attention to yourself. This isn’t rocket science. Don’t be afraid to request a refund if you’re unsatisfied for any reason, or if your SEO’s actions cause your domain to be removed from a search engine’s index. The contract should also require the SEO to stay within the guidelines recommended by each search engine for site inclusion. Don’t be afraid to request a refund if you feel that, and there is evidence to suggest that, the actions of your SEO have violated our guidelines (link to guidelines here) and caused damage to your search engine positioning, via penalty and/or removal. This avoids most reasonable possibility of the paragraph being taken out of context and avoids any SEOs potentially getting asked for refunds simply because their client is pissed off about something that may or may not have been the SEO’s fault, while still allowing the client the degree of protection (s)he/they should have. Because it’s the only industry where black and white are largely perceived to be the same colour. Adam, IMO, in the context of paying for SEO, the text isn’t written to keep anyone “happy”. They are there, so those who do pay for SEO services, know their rights, be it legal or moral. If they keep SEO’s on their toes and inform customers of their rights that is a good thing. The only ones who wouldn’t like that are the blackhats. Who cares what SEO think of Google’s Guidelines? I doubt Google does, their main customers are millions who use Google each hour. I would BET that Google only keeps blackhat SEO close because it’s always wise to keep enemies closer than friends. …. or you could make a stackable plug, a plug with 3 pins in the bottom and 3 holes in the top, and you can stack them, plugging in a new plug into the top of the other plug. Another great schwag could be a multi country adapter, especially since they charge so much for them. is it not possible to make those adaptors fan out in a semi circle to make a 5 way adaptor more compact, some sort of ‘compact travel splitter’. Look the at 3 way adaptor in your picture, image the 3 sockets curving around the plug, and increased to 5 in number. Imagine a semi circle, on the straight side is the plug, on the curved circumference is 5 sockets pointing out at angles 0,45,90,135,180. The sockets on the outside of the semi circle would be spaced at the proper plug interval so full plugs could go in, but the holes for the sockets would be closer together towards the center of the semi circle, so something needs to be done to avoid them touching, hence the alternate rotation of the sockets.. I wonder too, isn’t it time we had a little drawing widget for blogs. So that people can not only write but also scribble in the comments sections too? Central Ohio Search Marketing, Dave (original) , Multi-Worded Adam and other friends! Are Your Clients Entitled Of Refund For Ethical SEO Work? Sorry, Harith. I refuse to read Spham. I don’t think there’s a true SEO in the world that wouldn’t support the idea of customer awareness and protection. Anyone out for his/her client’s best interests owes it to the client to give the client as much information and boundaries that are as clearly defined as reasonably possible. It happens that in my rewriting ot the paragraph, a positive for SEOs was gained as well. That wasn’t the primary goal, although it did create a certain “win/win/win” situation for Google, website owners, and SEOs. The bigger issue is site owner protection and clearer explanation of what to and what not to expect. I wasn’t the guy that had the power adapter but I was the guy that denied you power access. I felt like a complete idiot when I realized who you were. Sorry Matt . . . make more videos so I can recognize you sooner. 😉 It’s been a while, plus your cats have become an icon of pop-culture. If you look at the cached text of the site. You will see all the spammy words weren’t even indexed and thus they aren’t having an impact on the SERPs (at least that’s the way I understand it). The site doesn’t invoke customer comfortability anyway with the poor design and the obvious overstuffing of keywords. Users are becoming more savvy. Even if they do get a click-in, I doubt their conversion is impressive. Harith, I’ll pop over and read it. But let it be known I think Sphinn makes the top ten worse “SEO” type site of all time. It seems VERY clear to me that Sphinn and associates have a vested interest in SE spam. That’s half of my point. I think it is 100% of Google’s point. Adam, IMO It would be unrealistic for Google to *repeat* their guidelines on a page just for those thinking of paying for SEO services. That would likely result in the few that do find them, hitting the back button. Shouldn’t that be a “few” thousand? Anyway, I pressed on regardless, but, like most “articles” on Sphinn, it puts a SPIN on what the facts really are. You are quoting text from Google and then writing replies by putting your own words in place of Googles. Like the idea for the plug adapters, but I’d suggest adding a surge-protector style fuse into them to avoid the overload situations described above. Schwag like this needs an added dimension – the plug section of the adapter needs to be able to be rotated 360 degrees so that two schwags can be positioned in a side by side power point, irregardless of whether the power point has obstructions (like a desk) nearby. How would the internal wires not get tangled up and not short out in that scenario, dockarl? That’s not a rhetorical question, either. I’m not sure if you’re visualizing something I’m not. Sounds good to me…. I’ve just upgraded my laptop recently and bought a great big bag to go with it for accessories. Should be able to cope with an adapter in it! Some sort of internal rotar cuff. Not positive, but I think I have seen these sold before. A really neat, but very expensive, way I have seen on TV, (so it must be true 😉 ) is a metal skirting board that is at the base of all 4 walls of a room. The plug can slide along it and be used anywhere along the 4 walls. Multi-worded adam – I imagine you’d use something like a bearing and plate arrangement – a bit similar to what’s used in some steering wheels. When i last visited India it was cool to see the cell phone companies have chargers all over the place in airports and stations. Just plug in no payment required. The US companies should emulate that. A little late, but I’ve read Eric Enge’s interview (great interview – thanks) multiple times now to make sure I’m absolutely correct in my understabding of NoIndex, NoFollow etc. Now, if you want to you can also add a NoFollow metatag, and that will say don’t show this page at all in Google’s Index, and don’t follow any outgoing links, and no PageRank flows from that page. Can a page with a NoFollw metatag accumulate pagerank? There needs to be some cool things like this in the Google Shop, available in European and UK varieties too. I’ve been giving talks on SEO & RIA at the Adobe MAX conventions (Chicago and now Barcelona). This will seem like a tangent, but you’ll see how it’s relevant. A number of developers and myself agreed, in a pub in Chicago, that Internet access should be free. We see it as a utility. We decided to start a movement to provide “free” Internet access for traveling geeks by bringing wireless routers with us and opening up access. The hotel I am now in charges 10 Euros per day! At the Chicago convention, a number of us decided that one of us would pay (me, since it was my idea) and bring a wireless router to broadcast to everyone else. The plot backfired for relevant reasons. Hey we use those adaptors all the time in the UK – I use them in my home office as well. Matt – If I plug even more computer stuff into the same AC outlet at home will it boost my SERP’s at all? Only if the outlet is PR4 or higher, so you’d better start link exchanging with other outlets in your house. Now hold on there, MWA! You MUST be a professional “link builder” to do any link exchanges AND charge a high hourly rate so your clients don’t work out a Monkey could do the same. Just saw a preview article about a new mini surge protector with 3 AC outlets and 2 usb ports. Now this would be the sweetest schwag given out at conferences. Its only $25 bucks to boot. 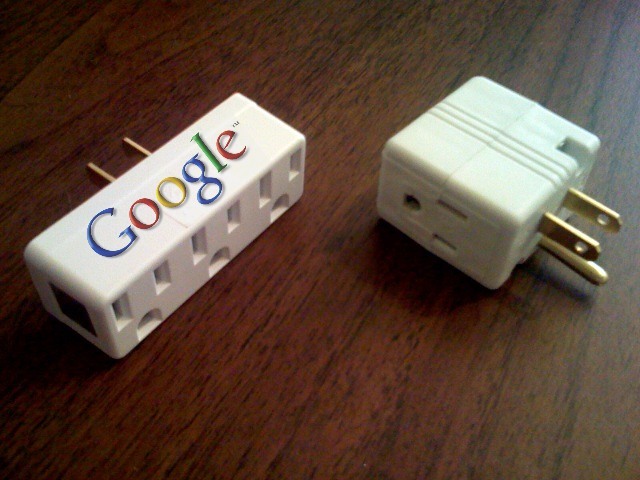 i prefer google branding of the adaptor to other brands, it’s great!